Read our reviews on Yelp.Com! House call service for cats and dogs by Maija Mikkola Curtis, D.V.M. Harbor Veterinary House Calls delivers high quality and compassionate in-home care for pets in Winthrop and East Boston. Due to overwhelming support, Harbor Vets is not currently accepting new clients. We offer a unique approach to veterinary medicine by providing comprehensive in home veterinary care for all stages of your pet's life. 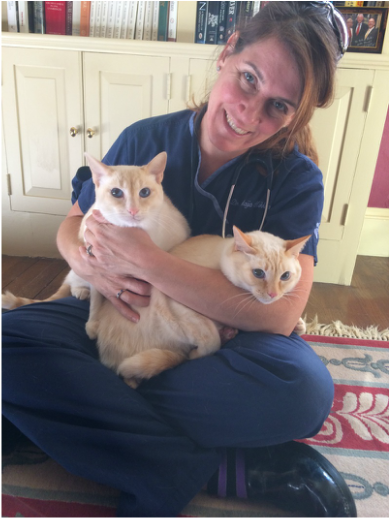 Dr. Maija Mikkola Curtis with some of her favorite cat patients - Avatar and Vulcan.